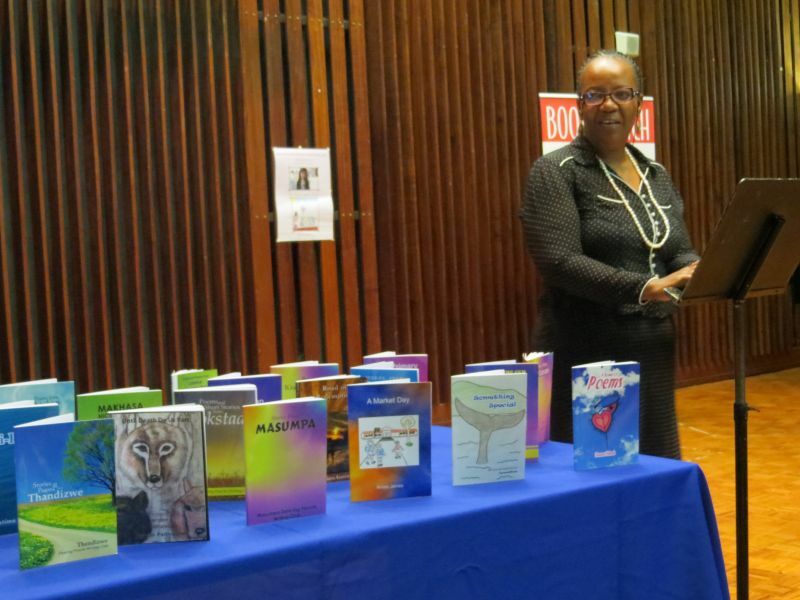 Dancing Pencils was honoured to have Ms Thizani Dlungwane of the KZN Office of the Premier to open its annual book launch. This took place in the SABC Head Office in the Blue Moon room on Sunday 8th September 2013. It started at 11.30 and finished at 3.00 pm. 8 of the 10 educational districts were represented at this launch. The value and respect that Dancing Pencils Writing Clubs play in the part of schools was evident by the great response of working clubs. Mashalazi Dancing Pencils Writing Club from KwaNgwanase on the Mozambique border was one such example. Teachers with 5 learners travelled all that way to be present and to receive just one copy of their new published anthology. This is due to a lack of funding, but the umSinsi team did the work required to edit, typset, design covers and publish books for clubs with enthusiasm but without finance. Representatives also came from Huluhluwe, Mtubatuba, Vryheid, Kokstad, Bergville, Ladysmith, Colenso, Msinga.and Empangeni. All received a hot dog and cool drink on arrival, and prepacked Briyani and another cool drink at the end of the programme which started promptly on time and finished on time. Clubs did lovely performance items, giving shy rural children the opportunity of expressing themselves to a large audience of more than 100 people. The Dancing Pencils Literacy Development Project committee recommended an award to Thembi Njoko for her commitment to literacy in developing clubs in the eThukela District. 20 clubs submitted anthologies in 2012 and Thembi aims to have Felicity train 300 learners this year, from Bergville, Ladysmith and Estcourt who will start new Dancing Pencils Writing Clubs in those areas. Dumisani Nyondo from the Msinga District also was presented with a gold framed certificate for his leadership qualities in developing Dancing Pencils Writing Clubs and submitting their work, on CD, by due date which is 30 of June.